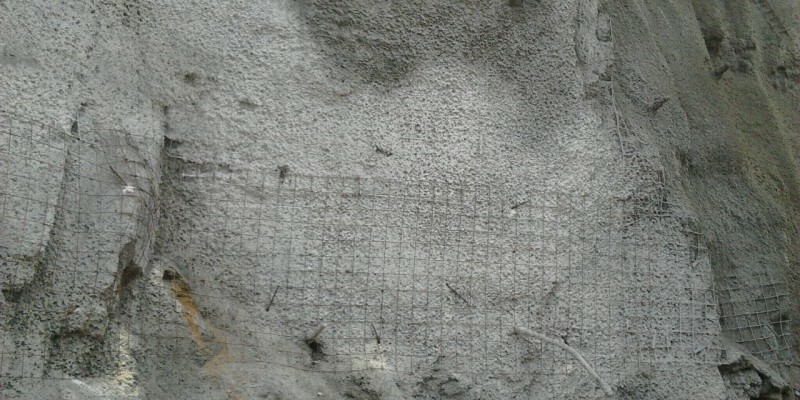 Shotcrete technique is used to achieve high strength and low permeability. It is a process in which mortar or concrete is conveyed through a hose and projected at high velocity onto a surface. This helps in achieving high strength and low permeability. The cementing material and aggregate are mixed in proper proportions, bagged in a dry condition and are transported right to a pneumatically operated gun to deliver a continuous flow of material through the supply hose to the nozzle. The nozzle’s interior is fitted with a water ring which uniformly injects water into the mixture as it is being discharged from the nozzle over the receiving surface. The cementing material, aggregate, water and admixtures are properly mixed similar to what is done for conventional concrete. The mixture of material is supplied to the delivery equipment, like a concrete pump, which pushes the mixture through the delivery hose by positive displacement or by compressed air. Supplementary air is added at the nozzle to escalate the nozzle discharge velocity. Supports underground openings in tunnel, mines, etc. Rock slope stabilization and support for excavated foundations, often in conjunction with rock and soil anchor systems. Channel linings and protection of bridge abutments. Rehabilitation of reinforced concrete structure such as bridge. Rehabilitation of deteriorated marine structures such as piers. Little or no framework required. Ideal for irregular surface application.